Fresh thyme works the best for this apple-y dish, but if you don’t have any on hand, dried thyme will work too. Feel free to adjust this seasoning to your taste, as thyme has a distinct flavor and aroma. My family doesn’t care for a strong kick of the spice, so I keep it to a minimum. You can add as much as 1 tsp of dried, however, if you love the flavor. 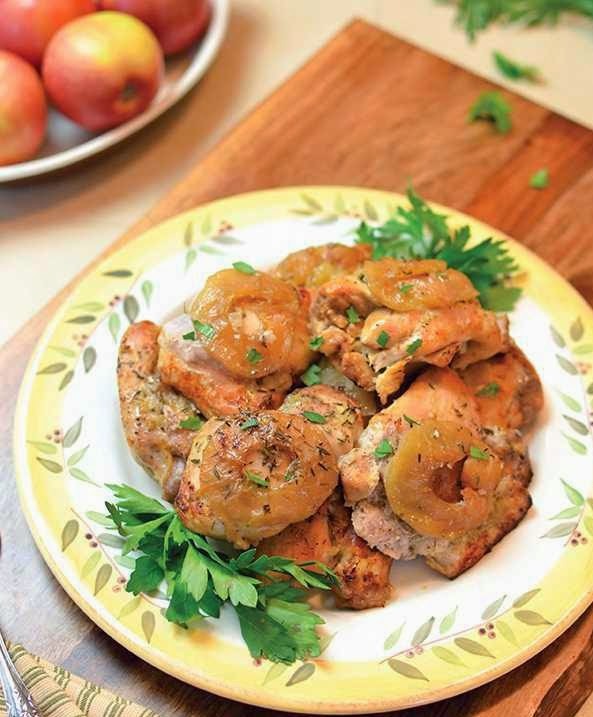 The combination of apple cider and apple cider vinegar gives this apple cider chicken thighs recipe the powerful apple flavor I was looking for, which makes it a favorite dish in the fall months. Place the chicken in a slow cooker, and season it with sea salt and pepper. Sprinkle the shallot, garlic, sliced apple, and bay leaf over the chicken. In a small bowl, mix together the sauce ingredients. Pour the sauce over the chicken. Cook the chicken on low for 6-7 hours or on high for 4-6 hours. Spoon the sauce over the chicken to serve. Or, if you’re feeling adventurous, ladle some into a small pan and simmer it over medium heat until reduced by half, and then serve over the chicken. Doing so thickens the sauce nicely and concentrates the flavors.